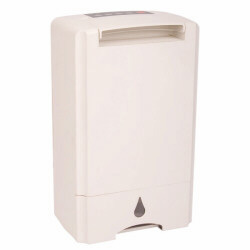 The Premiair PRDHZ80U, like the PDDS10, is a desiccant dehumidifier although of slightly less capacity than the PDDS10. It removes water from the air using a water adsorbing material and dispenses with the need for heavy and noisy refrigeration equipment. Current information suggests that this dehumidifier is no longer in production but some are still available with retailers and may be offered at discounted prices as stocks are cleared. Details of this model will remain on this site for the benefit of prospective customers until such time as this unit is no longer available for purchase from established and reputable suppliers. The Premiair PRDHZ80U adsorbs moisture from the air by passing that air over a desiccant wheel. A desiccant wheel is made up of multiple layers of a water adsorbing material, a desiccant, which "captures" water molecules in tiny pores in its surface. By mounting the desiccant on many layers the largest possible surface area is exposed to the air, which has many pathways through the wheel. This design ensures that the largest amount of moisture possible is adsorbed. The dehumidifier has a fan to draw in the air and a second fan to direct a stream of warm air over a segment of the wheel. The wheel turns slowly and during each rotation the entire wheel passes through the warm air stream. The heat energy in the air causes the water molecules to separate from the desiccant leaving the material ready to adsorb more moisture during the next rotation. The desiccant is thereby continually reactivated and is never used up. This process differs radically from that used in a refrigerant dehumidifier and does not require a compressor, evaporator and condenser coils, the refrigeration system. The advantages of a desiccant dehumidifier are its ability to operate in low temperatures, quieter operation, smaller size and lower weight, the last three being possible as a refrigeration system is unnecessary. The Premiair PRDHZ80U is capable of extracting 8 litres of water per day from the air at 30°C and 80% relative humidity. This does not appear to be a large amount by comparison with a refrigerant dehumidifier but the PRDHZ80U is far more effective in conditions in which a refrigerant dehumidifier will struggle. Refrigerant dehumidifiers suffer from a progressive loss of performance as temperatures fall below around 20°C. This is due to ice formation on the cold coil and a typical refrigerant model will provide poor performance below 15°C. The exceptions are refrigerant dehumidifiers equipped with an active defrosting system such as "hot gas defrost". This is different from "auto-defrost" which is a passive form of defrosting. Dehumidifiers with an active defrost system tend to be more expensive than many of the desiccant models now available. The amount of water removed from the air by the Premiair PRDHZ80U will be less at lower temperatures, simply because air "holds" less water when it is cold so there is less to collect. The key point is that a desiccant unit will lower relative humidity at these lower temperatures, down to 1°C, preventing condensation, corrosion, mold growth and other unwanted effects of excessive humidity. This capacity for effective low temperature operation is the most important of the advantages of a desiccant dehumidifier. The other advantages include smaller size and the Premiair PRDHZ80U is a compact dehumidifier. The unit measures 30.0 x 19.5 x 49.0cm so will fit readily into small areas. The PRDHZ80U is also light weight at 6.5kg and easily portable using the carrying handle. This is also a quiet dehumidifier producing only 34.2dB at the lowest of its three fan speed settings. Those considering a desiccant dehumidifier should be aware that the main source of noise in any dehumidifier is the fan. The compressor is a source of noise but desiccant units, while quieter than refrigerant equivalents are still audible and may disturb light sleepers. A consequence of the use of warm air to reactivate the desiccant wheel is that the air returned to the room will by 10°C to 12°C warmer than the ambient temperature. This is an advantage when drying laundry or in cold environments but will be unwelcome in summer and may not suit those who find sleeping in a warm room uncomfortable. Heating the air is the main source of energy use by the PRDHZ80U and is the reason why desiccant dehumidifiers cost more to run than equivalent refrigerant models. The water removed from the air is collected in a bucket with a capacity of 2.6 litres. The bucket may be emptied by hand or the unit may be set up for continuous drainage. This requires a small hose to be attached to a port in the dehumidifier and the water will run to a nearby outlet, under the force of gravity. For best results it is advisable to mount the dehumidifier above the level of the outlet, a drain or sink. The Premiair PRDHZ80U provides three settings, quiet, normal and powerful (for laundry drying) modes. These are accessed using the electronic controls from which the eight hour timer may also be set. In summary the Premiair PRDHZ80U is a competent desiccant dehumidifier and will perform well in cold environments, such as a garage in winter. For use in the living areas of the home the choice will depend on whether the small size, low weight and relatively lower noise level of this unit outweigh its higher running costs. If the heating effect will be unwelcome this will be a disadvantage, in a garage, in cold weather and for laundry drying it is an advantage which compensates for the higher energy use.